Jerry Weintraub is an interesting character. He passed away not too long ago and most people might not recognize his contribution to the entertainment world. He was a manager of great entertainers and helped many famous and successful folks with their careers. A few years ago I read Jerry’s autobiography. I really had no idea who the man was, but I like reading biographies and I saw his at a Barnes & Noble one weekend. I think it was on sale and I figured why not check it out. What I found was the story of an incredibly driven man. He would have ideas and he wasn’t afraid to see them through. He failed many times, but that never held him back. He was never afraid to keep moving forward. As we know, losers can’t handle failure so they stop trying. Winners are bothered by losing, but they don’t let it hold them back. Jerry was a winner. 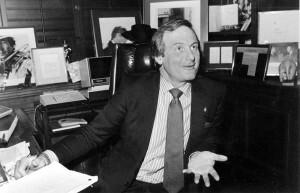 Jerry Weintraub was involved in music, movies and more. He helped take John Denver from a folk singer looking for a breakthrough to perhaps the biggest star in the music world in the ’70s. He produced all kinds of films including the Ocean’s Eleven remakes in the 2000s. Throughout it all the trait that stood out the most to me about Jerry was his persistency. I thought today we could take a look at some lessons about persistency from one of the men that truly lived the American Dream. One of the best stories about Jerry Weintraub was how he started working with Elvis. It was sometime in the late ’60s or right around there and he had an idea or a dream to take Elvis out on tour. At this point Jerry was still working on building his reputation and career. He was certainly a success, but we’re talking about working with Elvis. And Elvis doesn’t need to work with anybody. He’s already the man. He can hold out for the best ideas and even with a good idea he doesn’t have to do anything. But Jerry had his idea for taking Elvis on tour. He had thoughts on how to make it really profitable, much more profitable than the average tour at the time. I think he figured that with Elvis on board he would have the leverage to book and promote dates without local help or something like that. Anyway, Jerry had the idea and called Col. Tom Parker, Elvis’s manager, to discuss. Parker didn’t have time it. Thanks, but not thanks. We’re good. Okay, whatever. So maybe the average person would call back a couple more times and figure it’s done. Jerry called back everyday for a year. That’s 365 days in a row. He and Parker would discuss the idea, but also got to know each other. Finally after a year Parker called Jerry and told him that if he wanted to take Elvis on tour that he should meet them at Elvis’s show in Vegas with a million dollars in cash. That was Parker’s test to see how serious Jerry was and how much pull he had. Jerry scrambled through all his contacts and finally got an investor with a million in cash on hand. I think he had like 2 or 3 days to do it. He did it. The tour happened. It was hugely successful for all involved and Jerry then had artists like Frank Sinatra knocking on his door. Now, persistency on its own is great, but the reward has to be worth it. For Jerry, it wouldn’t have been worth it to be this persistent with a lower level entertainer. He went after the biggest entertainer in the world. He knew the payoff would be huge so making one phone call per day in comparison wasn’t really that big of a deal. So it’s beneficial for you and that makes your persistence worthwhile, but it also has to be beneficial to the client or partner. Jerry went after Elvis and Tom Parker and he knew the idea needed to be a good one for both of the men. Elvis needed to make money and so did the Colonel. The idea was a great one, but as we know, Elvis didn’t have to act on anything. He was good, but eventually Jerry’s persistency paid off and he was able to convince the Colonel that the idea was not only a good one, but a great one. Parker really grilled Jerry on all the ins and outs of the idea and wasn’t convinced even with the fine details. It took real work to make sure the deal would be mutually beneficial. This is for a business sense. If the deal is worthwhile for all parties involved then you can have the confidence to pursue it. You can’t force someone to go into business with you, but you can use your persistency to win them over. And it’s not all about the deal. It’s about connecting as people. So you’re selling yourself too. Col. Tom Parker wasn’t going to send Elvis out on tour with someone he didn’t know. He really put in the time and made Jerry work so he could get to know him man to man. Hearing “no” 364 times is an incredible amount. That would deter many people, but Jerry knew that it only took one “yes” for his career to change…and it did. Persistency is a unique quality among successful people. It means staring in the face of failure and rejection and continuing on. In life, deserve’s got nothing to do with it. You’re not owed anything in life. You have to work for it and you have to be persistent. Take the lessons from Jerry Weintraub’s life and use them in your own. If you’re going to be persistent, make it worth your while. Then make sure it’s beneficial to the other parties involved and probably more than it is for you. Finally, don’t take a “no” personal. You’re going to hear it. Accept that fact and keep working until you touch on the right points to win the person over.